Fabulous tropical flavors will transform your next salmon dinner. The salmon is baked with a fruity marmalade glaze, and then it is topped with a fresh, flavorful topping made with fresh mango. Enjoy! In a small mixing bowl, combine the peach and mango marmalade and minced garlic. Spread directly onto the salmon fillets. 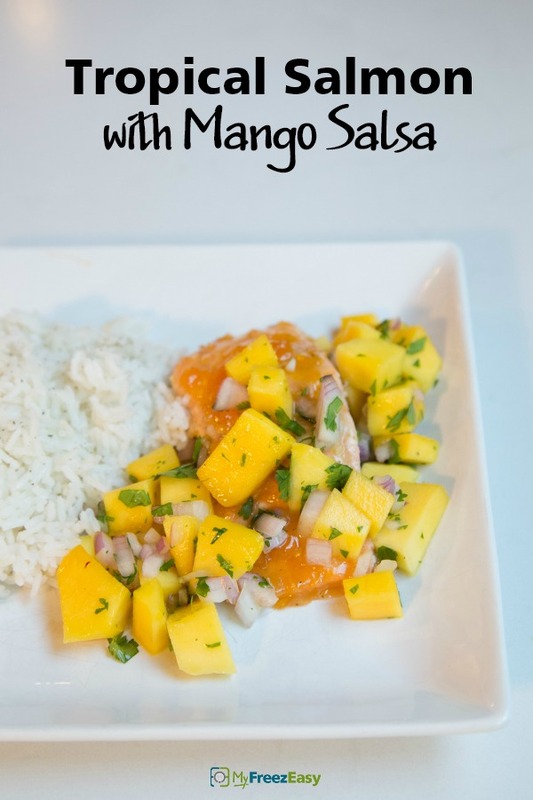 While the salmon is baking, mix up the fresh mango salsa. Chop up the ripe mangoes and red onion. Add both to bowl with the chopped cilantro and lime juice. Toss together and add as topping over each of the cooked salmon fillets. Serve Tropical Salmon with Mango Salsa and side salad. In a small mixing bowl, combine 1 cup peach mango marmalade and 2 tsp minced garlic. Put baggie in the freezer and freeze up to 6 months in fridge freezer or 12 months in a deep freezer. Thaw in the fridge overnight, or a warm bowl of water for about 20 minutes, before transferring the salmon, glaze and toppings to baking dish. Bake at 400 F/200 C for 15 to 20 minutes. 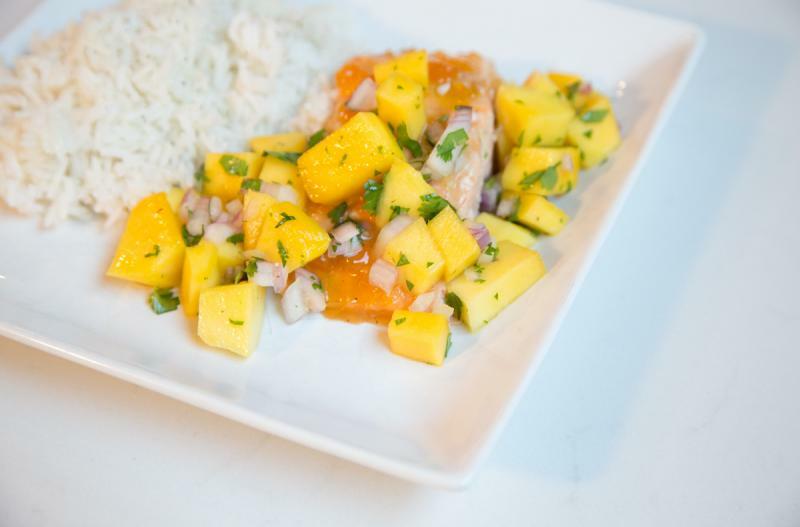 Prepare and top each salmon fillet with the mango salsa, as directed in the recipe. Thaw completely, then bake at 400 F/200 C for 15 to 20 minutes, or until salmon is no longer pink in the middle. Mix up fresh mango salsa for topping.